Shaving or waxing to remove unwanted body and facial hair can be a pain. It takes time and is uncomfortable. Fortunately, the problem of unwanted hair can be resolved with a new hair removal technology that uses Intense Pulsed Light (IPL). This service is offered in the dermatology clinic of Dr. Matsuda and Dr. Sheu in Honolulu. Light based hair removal is growing in popularity as more and more people want permanent reduction of unwanted hair. The procedure makes use of highly concentrated light beams directed into the skin’s hair follicles. This light is absorbed by the pigments found in the follicles, damaging the hair follicle and destroying hair in the process. As a result, hair becomes less noticeable and much finer. The number of sessions needed by the patient depends on your hair type and the area where hair is being removed. WHAT ARE THE BENEFITS OF LIGHT BASED HAIR REMOVAL? Precision — Only the dark, coarse hairs are targeted, leaving the surrounding skin unharmed. Predictability — It typically takes an average of four to six sessions to experience permanent hair reduction. Speed — Every pulse delivered by the IPL takes less than a second and allows many hairs to be treated at the same time. An area approximately the size of a quarter can be treated in less than a single second. Even some parts of the face, such as the upper lip, can be treated in about a minute. Treatments for larger areas such as the legs or the back take up to an hour. WHO ARE GOOD CANDIDATES FOR IPL HAIR REMOVAL? Patients with lighter skin and darker hair are more likely to get excellent results from IPL hair removal. However, IPL innovative technology allows patients with darker skin to enjoy optimal results from the treatment. HOW SHOULD I PREPARE FOR MY LIGHT BASED HAIR REMOVAL TREATMENT? Avoid plucking or waxing for at least six weeks before your treatment. Avoid excessive sun exposure and tanning beds 2 weeks prior to the procedure. Avoid the use of deodorants, perfumes, and other substances that are potential irritants. Don’t take aspirin and other anti-inflammatory drugs immediately prior to the procedure, as they can increase your risk of bruising during treatment. There may be some discomfort during the procedure, but it is well tolerated. It usually feels like a pinch or a slight zap with each light pulse. Most patients have reported that IPL hair removal is much less painful when compared to other hair removal methods they have tried. HOW LONG DOES LASER HAIR REMOVAL LAST? 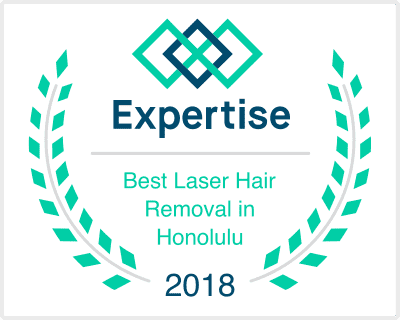 IS LASER HAIR REMOVAL PERMANENT? The results of IPL hair removal vary for each individual. Sometimes it takes multiple treatments to achieve desired results. There is permanent reduction in hair regrowth . A few patients with hormonal imbalance may require maintenance treatments. WHAT WILL I EXPERIENCE AFTER MY IPL HAIR REMOVAL TREATMENT? Immediately after the procedure, the targeted area may appear red and swollen for the first couple of hours. The skin where treatment was administered may appear crusty and sting slightly for a day or two. However, these symptoms can be alleviated through the application of moisturizers and cold compresses. Patients with darker complexions or recent sun or ultraviolet light exposure may have slightly higher chances of developing blisters. During the healing process, you are advised to regularly wash your skin with soap and water in a gentle manner. You should avoid scrubbing the treated skin vigorously and avoid excessive sun exposure for about a week after the procedure. When outdoors, make sure to apply sunscreen with an SPF of at least 30.